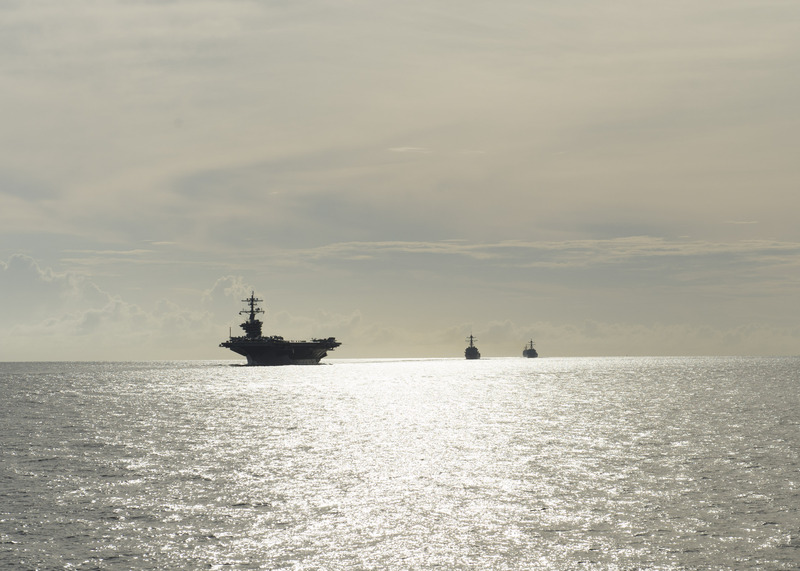 The five ships of the Carl Vinson Carrier Strike Group (CSG) have entered the U.S. Navy’s Middle East area of operations — U.S. 5th Fleet — on Wednesday, according to a release from the strike group. The ships will now likely transit to the Persian Gulf to relieve the George H.W. Bush CSG that has been flying regular information, surveillance and reconnaissance and strike sorties over Iraq and Syria as part of the ongoing campaign against Iraq and Syria Islamic State (ISIS or ISIL) since August. “All of our hard work and effort through the workup cycle was done with operations in this part of the world in mind,” said Rear Adm. Christopher Grady, Vinson CSG commander. The Naval Station San Diego, Calif. Vinson CSG is comprised of Nimitz-class carrier USS Carl Vinson (CVN-70), guided missile cruiser USS Bunker Hill (CG-52) and guided missile destroyers USS Gridley (DDG-101), USS Sterett (DDG-104), USS Dewey (DDG-105). The CSG is embarked with Carrier Air Wing (CVW) 17 and elements of Explosive Ordnance Disposal Unit 3. The Vinson CSG left San Diego on Aug. 22 and participated in the training exercise Valiant Shield 2014 in September off of Guam along with the George Washington CSG. The Bush CSG departed Naval Station Norfolk, Va. Feb. 15 and has begun its return to homeport.